Hi, your blog is like my lifeline right now. I’m having the surgery in 17 days and am kinda freaking out because the last time I went under I woke up shaking. I was just wondering how you managed to stay to optimistic pre and post op because I can’t for the life of me get rid of the thoughts of all the things that could go wrong. If you found this blog as I did, you will be comforted to know that other people have been through the same thing you are about to endure, and now we are all happy we went through with the procedure. As long as you can power through the discomfort and the restrictions on sleeping/ eating you will be fine. The first week is definitely the worst, after that it gets a lot better!! Thank you for this website and 4 years later I see you’re still around answering questions and leaving comments. A little about me I’m 35 years old *yes I’m sooo old* compare to everyone here that’s having this done. I will be having this double surgery tomorrow and I’m anxious and scared at the same time. Not knowing what to expect – but reading your blog gives me an idea what’s next…I just wanted to say thank you again for putting this together. I do want to capture my daily if not weekly progress as well specially for people around my age! opps sorry, I meant how long was it until you could resume to your normal activities (like going out in public, or taking walks. )I would like to take some light walks during my recovery just to keep my strength up. Is that normally ok to do with this surgery or is their to much force from walking? My jaw was held shut by way of really tight elastics. You can expect to have your jaw help closed as this is normal for the first month or so following surgery. You’ll have to explain what you mean by “physically led up” so I can answer that question. Hi Jess, My surgery is also the same day as yours Friday, May 9. Good luck with yours. Jess, you should be able to dance with no problem at your friend’s wedding. You’ll still be a bit swollen at that time, but you’ll have your energy back by then. Enjoy the party! Hi! I just want to say thanks for posting your experience. I’m getting operated on my lower jaw on Tuesday to fix my underbite and crossbite and I am seriously freaking out! I’m going in solo and the doctor didn’t go into too much detail on how it’s going to go or how to recover. So finding your blog was a help on epic proportions. Your before and after pictures were pretty reassuring too! Valerie, I’m always happy to provide a bit of reassurance for people like yourself. Be brave and remember that this will all be in the past in just a few short months! I just read about your jaw surgery I am getting double jaw surgery I am really scared. How long will I be on clear liquids? I was wanting to take my own pillow with me to the hospital? I think my mom is going to stay with me over night and my boyfriend and my dad. I need to know if you we’re scared? Allie, I find it amusing every single time somebody understands what I mean when I speak of some of the more awkward pains experienced after this operation. Enjoy the forced rest and you’ll be back in action soon! Hi Graham. 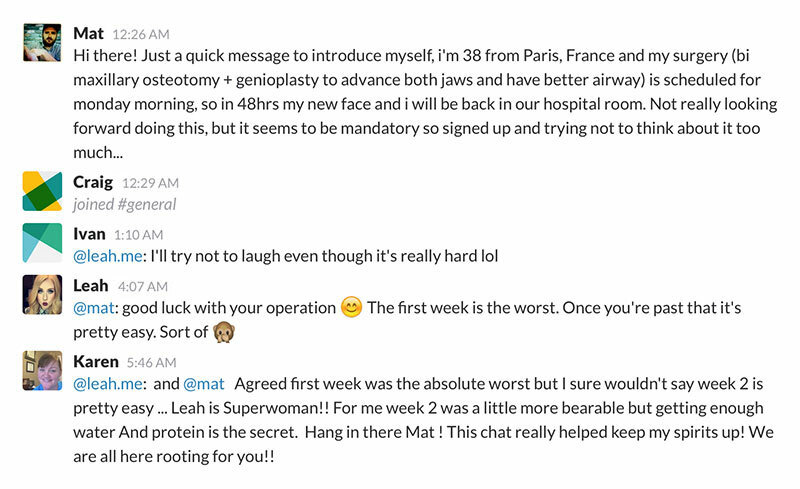 I’m about to have the same kind of surgery that you had( T -25) and I was really happy to find your blog. I’ve started to write my own blog(in french) and was wondering if I could put a link to your site. I think it’s really complete and encouraging. Your before/after photos are great. My surgeon don’t have the software to simulate the operation so I have no idea what it’ll look like for me. But seeing your before/after photos is reassuring. I also liked all your tips 😉 I hope my blog will be as popular and helpful. OMG im getting jaw surgery, im just not sure if its double or just on top, but i know it has to do with my teeth on top, anyways i have the appointment for the appointment in december! anyways, im really worried about the weightloss.. BECAUSE im really skinny &i dont like it at all. so i really dont want to lose anymore weight because then stupid people start making comments & say im anorexic or bulimic or something, but its really not my fault i CANNOT gain weight i dont know why but i just cant! is there ANY way that i could stop from losing alot weight? Hi Graham! I’m actually getting this surgery in about 4 weeks! This has helped me so much! I actually have to get double jaw surgery too. I’m so glad you made a blog because I really had no idea what I was getting into! Lol do you have any advice before surgery? My only advice prior to surgery is to think positively the whole way through, make sure you get out for walks in the sunshine each and every day, drink as many fluids as possible, and find a good TV series to watch. That’s crazy that you’re going to a different country to have the surgery performed. That sounds so important! I hope your recovery goes amazingly well! ahh I’m getting lower jaw surgery+ genioplasty (I don’t think it’s as severe as double jaw surgery, I guess I’m kinda..lucky? haha) this month and they’re sending me to Venezuela since there are no surgeons here that do this kind of stuff(Aruba). I’m veeerry exited haha since I’ve had my braces for 3 1/2 years (the orthodontist said “aww you’ll need braces for only 1 or max 2 years”…so untrue ;___;). Well anyways thaaanks your blog is very informative and entertaining haha cant wait until i can bite right into an apple or not having to cover my mouth when I eat haha. I wouldn’t worry about it just yet. It sounds like you’ve got ample time to get into the proper emotional state for this operation.